People who love to read have followed that advice ever since – even if they’ve never read Confucius. The third president of the United States, Thomas Jefferson, once remarked that he couldn’t live without books. During his presidency, Barack Obama put aside an hour each day to read, something his successor would do well to emulate. A thirst for knowledge seems to me to be an essential requirement not just for politicians, but for every single one of us. If we aren’t learning something every day – no matter how small – then we’re essentially wasting our lives. Sure, you’re busy, aren’t we all? But consider this. The wealthiest and most successful business people are avid readers. 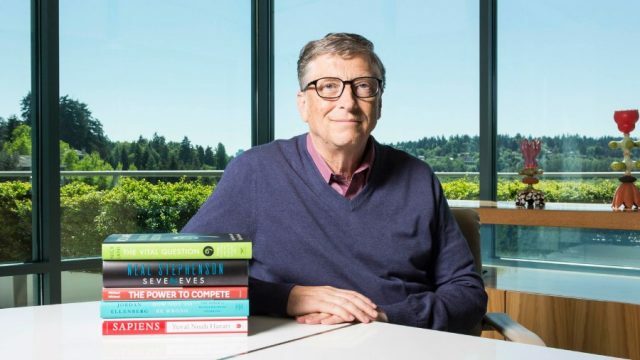 Bill Gates reads a book each week and his business hasn’t suffered – he’s still the richest person in the world. When Warren Buffet began his business career he made sure to read at least 600 pages each day; he’s often said that reading builds knowledge and the more knowledge you have the more successful you will be. When Elon Musk was asked where he learned to build rockets, he answered, “I read books.” As well as reading investment and other business books, Australian entrepreneur Mark Carnegie immerses himself in classic literature because he recognises the great writers have much to teach us. Scholars agree that we can learn an enormous amount from reading Shakespeare, Virgil, Dostoevsky, Jane Austen and others. Their works provide profound revelations and insights into the human condition. And it’s significant to learn that Gates, Buffet, Musk et al are also appreciative readers of fiction. Someone once said that knowledge is power, but really it’s so much more. Knowledge is an investment in our future, both as individuals and as societies. Knowledge improves our lives both on a practical level and an intellectual level. Education is the greatest gift we can give people, and equality of educational opportunities should be paramount for all governments. An educated population means a more thriving economy and better outcomes for all. An educated, well-read population is open to positive change, is more tolerant, is able to see multiple sides to arguments and make more informed decisions about important life issues. But education doesn’t stop with the end of school or university. Indeed, a formal education isn’t a prerequisite to learning – there are plenty of examples of successful people who didn’t finish their schooling or dropped out of uni. They’ve become successful because they’ve read, they’ve learned, they’ve applied. The critical point is that each of us should be actively trying to learn something new every day. We should and must devote some time every single day to furthering our own individual knowledge bases. Constant learning should be our common motto. This doesn’t mean that you have to sit down and read Tolstoy or Schopenhauer but you should at least read for a dedicated period each day and feel that you’ve taken away something new. As a writer I try to be as informed as possible about a huge range of subjects; I read masses of fiction and also non-fiction such as biography, history, poetry, philosophy. Hopefully, this translates to my writing, but more importantly than that, reading feeds my soul and my unquenchable thirst to know things; it satisfies my insatiable curiosity about how the world works; it teaches me to think outside the square and to learn from others. Ardent readers understand this – they’re exactly the same. Reading enriches us, gives us an endorphic feeling of self-fulfilment while showing us how to empathise with others by challenging some of our preconceptions. The more reading you do, the more interests you have, the better your overall knowledge, and hopefully the better person you’ll be. Someone once said that knowledge is power, but really it’s so much more. Knowledge is an investment in our future, both as individuals and as societies. Knowledge improves our lives both on a practical level and an intellectual level. But wait, there’s more! Reading can make us better at our jobs. By being selective about your choice of reading material, you can gain more knowledge about your particular field. Warren Buffet and Bill Gates, for instance, read books about the stock market, how to value and invest in companies, how to deal with stress. Sheryl Sandberg, Facebook’s chief operating officer, reads books about ethical business practices, using innovation in the workplace and how to turn your weaknesses into strengths. Clearly, these business people are constantly reading, adding to their knowledge store and ultimately their bank balances. Whatever field of work you’re in, reading will help make your job more meaningful and productive. Perhaps it will lead to further opportunities and maybe even pay increases. In certain industries, if you’re not on top of the latest developments, innovations and markets, chances are your job may end up being at risk. If you’ve taken the time to read what’s going on in your industry, if your skills are constantly being honed, then you become more valuable to your employer. Advances in technology have changed the nature of many jobs over past decades and centuries, so it’s to your advantage to keep informed – through reading – about those changes and how best to adapt to them. Knowledge builds confidence. Knowledge makes you more marketable. Knowledge has value. Something that isn’t often made much of is that knowledge can be shared and given away without the knower losing anything. We can share what knowledge we have on various subjects with as many people as you can imagine and still have that knowledge in our brains. Scientists, for instance, share their knowledge with the wider world all the time. Their never-ending hunger to unlock the secrets of our bodies, our world, galaxies far away has brought us untold benefits in health, technology and day-to-day life. History instructs us, non-fiction informs us, and literature not only moves us but also teaches us valuable life lessons. There’s everything to recommend in reading. Renaissance scholar and theologian Erasmus wrote, “When I get a little money, I buy books. If any is left, I buy food and clothes.” We don’t need to go as far as Erasmus, but his message is clear: read, learn, become knowledgeable. Find a half-hour or more each day to read. You’ll be happier, more fulfilled, less stressed and you’ll be a hell of an asset at Tuesday’s trivia quiz at your local pub.